Loggins is appearing as himself in the finale (appropriately called “Celebrate Me Scones”), but he isn’t the only familiar face to expect: LOUIE’s Pamela Adlon is also guesting in the final episode of the year. PLAYING HOUSE went all out for its second season finale: the beloved USA Network comedy nabbed Kenny Loggins for a guest spot. 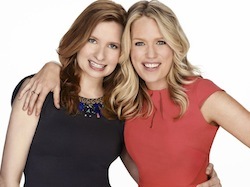 I was on the set of the PLAYING HOUSE finale — right before creators/stars Lennon Parham (Maggie) and Jessica St. Clair (Emma) met/filmed with Loggins — and the duo was still giddy about landing him for their show. RAISING HOPE’s Mike Mariano opted to give the underrated Fox comedy proper closure in its season 4 finale in case the show wasn’t renewed for a fifth season (he bet correctly), and so the Chances ended on a quiet note…with the exception of Virginia’s father, Arnold, moving into Jimmy’s old room.